280 pages | 44 B/W Illus. Ian McHarg’s ecological planning approach has been influential since the 20th century. However, few empirical studies have been conducted to evaluate the performance of his projects. 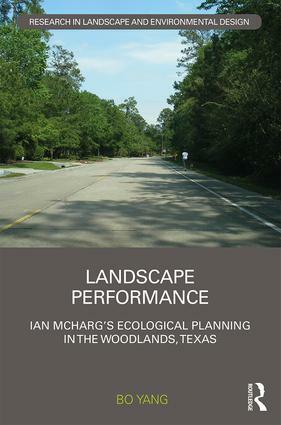 Using the framework of landscape performance assessment, this book demonstrates the long-term benefits of a renowned McHargarian project (The Woodlands town development) through quantitative and qualitative methods. Including 44 black and white illustrations, Landscape Performance systematically documents the performance benefits of the environmental, social, and economic aspects of The Woodlands project. It delves into McHarg’s planning success in The Woodlands in comparison with adjacent Houston developments, which demonstrated urban resilience after Hurricane Harvey in 2017. Lastly, it identifies the ingredients of McHarg’s ability to do real and permanent good. Yang also includes a number of appendices which provide valuable information on the methods of assessing performance in landscape development. This book would be beneficial to academics and students of landscape architecture and planning with a particular interest in Ian McHarg. Bo Yang is an associate professor of landscape architecture at the University of Arizona, USA.